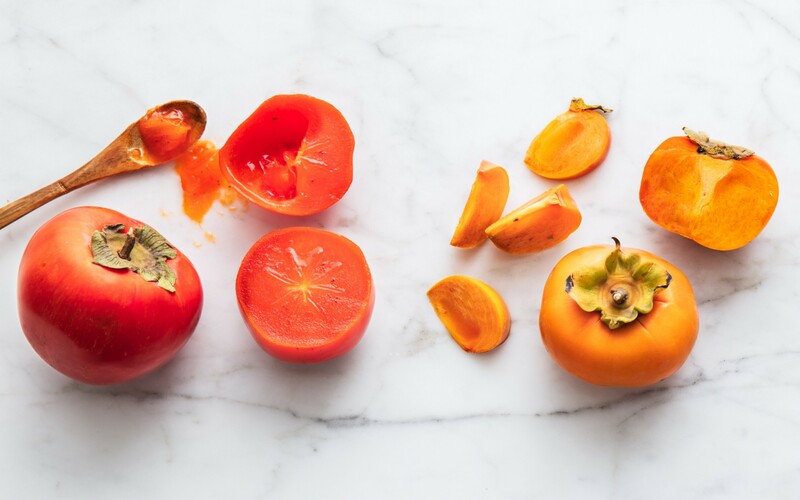 I tried the Fuyu Persimmon the other day. First time tasting and cooking with them. I wouldn’t say it was a complete disaster, but it wasn’t what I was expecting or working towards. The fruit was hard and I figured by the time I got to cooking them, they would be ripe(r). I found a recipe calling for caramelized onions and caramelized persimmons. The pork loin I was making would be a great complement to the dish. I started peeling the persimmons and realized they were slippery and still a little firm. I cut off a smaller piece to taste it and immediately tasted a sweet pumpkin. Almost at the same time though, the chalkiness hit me. It felt like it sucked all the moisture from my mouth and I couldn’t get rid of it. It gave me a little pause but I thought maybe the chalkiness would cook itself out with the onions…Wrong. My dish was a pork loin, roasted potatoes, caramelized onions and persimmons. The chalkiness ended up leeching out into a milky-type gel. The persimmons were still chalky and in my opinion, inedible. I tossed out the persimmons and stuck with the potatoes and onions. You could taste a little of the persimmon. It would have been great if they were much riper. Next time, I’m going to let them sit longer. I’m going to reread the article below because I’m confused. The Fuyu persimmon (labeled by the store) was the orange one, not the red one and the Hachiya one is supposed to be the chalky one. Fall’s perfect snacking fruit, demystified. UPDATE: I’ve removed the link from the source because the website that was being referenced has been updated and the original post was removed by them.